Marmaduke Dodsworth is just about the most lovable British ghost you’ll ever meet. 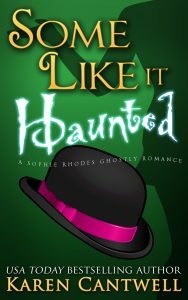 But Sophie Rhodes and her new boyfriend, Cal, are becoming frustrated with his untimely appearances and intrusions. Marmaduke isn’t the only force complicating Sophie and Cal’s love life, though. Cal’s nefarious ex-wife is suddenly and suspiciously present in their lives. And Sophie’s old boyfriend, Shane Daniels, causes problems when he shows up desperate for help after he picks up a clingy ghost from a local haunted house. Throw in a cold case missing person investigation and a lust spell that affects both mortals and ghosts, and things get downright batty. Will Sophie and Cal’s two-month relationship weather the storm of obstacles thrown their way? Will they pass the many tests of their devotion? Will Marmaduke ever stop talking? These questions and more answered in Some Like it Haunted.